I must bring up a contentious issue. 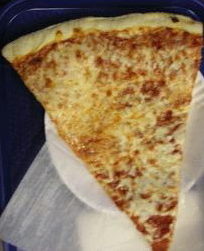 Some years ago, it came to my attention that many people don’t understand where the top of a pizza slice is. Allow me to set the record straight, clearly and without any ambiguity. The first photo is right-side-up. 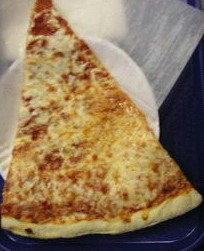 The top of a slice of pizza is the point. The bottom is the crust. End of story. Take your standard everyday analog clock. You wouldn’t think that a device that’s been around this long would have bugs in it, would you? I never really thought about it until I started teaching my son how to tell time. Telling time is easy. You look at the hour hand. See what number it points to. That’s what o’clock it is. If it points to 7, it’s 7:00 o’clock. If it’s between two numbers, it’s between o’clocks. Halfway between 4 and 5? It’s half-past 4 o’clock. Almost at 11, but not quite? It’s almost 11 o’clock, but not quite. The hour hand tells you the time to within 10 or 15 minutes. Almost all the information on the clock is in the hour hand. So which hand is more prominent? Not the hour hand, the minute hand. The minute hand is always the long one, which means it draws the eye more, and is easier to read. This is an interface bug. The most important information should be the most prominent. Stop yammering about Cheney’s hunting accident. It’s not important. It has no larger ramifications. Last week, Peter Daou wrote an excellent post about Scandal Fatigue, widely cited, and yet this week every blog is taking time out to try and make points on the Cheney incident. Every time you talk about this, you’re not talking about illegal wiretapping, torture, lying AGs, record deficits, corrupt majority leaders, etc. I ate at Romano’s Macaroni Grill for the first time last week. I was particularly intruiged by their “Create your own pasta” dish. (I accidentally called it “Make your own pasta” when I ordered, our waitress instantly corrected me. Lordy.) To create your own pasta, you are a given a menu. You pick any of six noodles, eight sauces, up to three vegetables out ten, five meats, and a couple of salads (numbers are from memory). That’s a good amount of variety. And in fact the meal was delightful and I will return. So why am I blogging? Because of the catchphrase on the menu. “The possibilities are endless”. No, they’re not. The possibilities are not endless, they are finite, countable, and easily calculated. But Romano’s is not the only offender. Let’s talk about Waffle House. They claim prominently on their menu how many ways there are to prepare a burger. On their website, they claim at least 70,778,880 different ways. This was deconstructed nicely in this article. Here’s how you do math for something like this. How many possible toppings are there? Eight. Each one can either be there or not — two ways for each topping. So you take two, and multiply it by itself eight times. This equals 256. How do you get from 256 to 70 million? You can’t. You can get weasely to get closer. For instance, you could either have a bun top, bun bottom, or not. That’s another factor of 4. You could get the burger rare, medium rare, medium, medium well, well done. That’s a factor of 5. That gets you to 5,120. We are almost halfway to supporting their claim (because 5,120 squared is almost 70 million.) But we’ve used everything we got. Here’s one way to explain the discrepancy. Consider the clientele and employee base at Waffle House. Do they strike you as particulary sophisticated when it comes to mathematics? I’d guess over half the people who eat there need a tip calculator to figure out what 15% of $10.00 is. The workers are no better. It’s the bottom of the barrel, no getting around it. The management doesn’t look like they’re taking Number Theory courses at night either. So based on this limited sample, we conclude that everyone associated with Waffle House is a drooling idiot of some kind. I conclude that their advertising claim is false, but is merely due to stupidity rather than malice. *Interestingly, this number is the exact number of seconds in a day. I often need to use this at work to convert dates to datetimes and back. From now on, all my code will call it the “Romano” factor.